Giants head coach Tom Coughlin expects Michael Vick to start at quarterback this Sunday for the Eagles, regardless of the concussion questions. Just in case., the Giants also are preparing for Mike Kafka and Vince Young but not Brett Favre, who remains retired. "We will prepare as diligently as we can and refine it as it goes along," Coughlin said on a conference call Wednesday. "That's basically the way we would operate." Steering clear of Giants players comments that they wanted Vick to start this week - a slice of the trash-talking going on at Exit 16W in the wake of the devastating loss to the Eagles last year - Coughlin became evasive. "All I've said about that is if Michael Vick can possibly play, he will play," Coughlin said. "I have not heard any of that stuff. As far as I'm concerned, and I think as far as our players are concerned, last year was last year and this is a new year and new teams and we're going in and trying to take advantage of the moment." Coughlin said he was was "surprised and disappointed but that's part of the business so we move on" when Steve Smith signed with the Eagles. 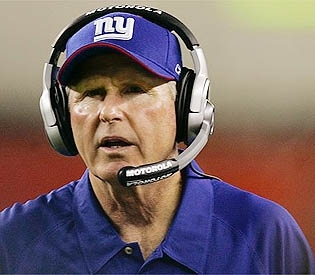 Asked why he was disappointed Coughlin replied, "Why? Because Steve's a good football player."